SoL columnist Erhan NaIçacı writes on the recent conflict between Russia and the US over the Black Sea and Ankara’s position in this conflict and its recent plans of operation in Syrian territory. In his previous article on the incident, Nalçacı argued that the apparent fact that Ukraine did not inform Russia about passing to the Sea of Azov was ‘a provocation coordinated by the US and aimed to trigger Russian aggression’. According to him, the provocation corresponded to a far-reaching agenda, which sought to enhance the rise of fascist-nationalist movement and sentiment and obstruct the German attempt at broadening its autonomy against the US regarding its relations with Russia (significantly Nord Stream 2). On 25 November 2018, the Ukrainian navy vessels attempted to pass to the Sea of Azov through the Kerch Strait, which separates the Kerch Peninsula of Crimea in the west from the Taman Peninsula of Russia’s Krasnodar Krai in the east. According to the 2003 Treaty for Cooperation in Utilizing the Azov Sea and the Kerch strait signed between Ukraine and Russia, the Azov Sea and the Kerch strait are considered as internal waters of Ukraine and Russia. Nevertheless, Russia arguably de facto annexed Crimea following the Crimean referendum in 2014. Although neither Ukraine nor Russia annulled the Treaty, Russia considered the passing of the Ukrainian navy vessels as ‘a dangerous provocation that violated the Russian state border, jeopardized sea traffic, and the security of people’. The provocation undertaken by Ukraine has brought certain consequences. It is clear that the US coordinated the provocation since Ukraine does not have a notable military force against Russia. The European Parliament called for the suspension of the Nord Stream 2, which would edge Ukraine out and pipe Russian natural gas to Germany through the Baltic Sea, on the grounds that it posed a threat to the security of European energy. It should be noted that the decision was taken by the votes of 433 members against 105 members since such numbers give an insight about the representatives of various capital fractions. Rumour has it that Ukraine could attack Donbass to continue its provocations. The former Foreign Minister of Germany argued that Ukraine wanted to ally with Germany in a possible war. One should think of the US instead of Ukraine. As far as we know, Ukraine unofficially claimed that the Kerch incident was a casus belli and NATO vessels should arrive at the Sea of Azov through the Istanbul straits by giving references to the 1936 Montreux Convention. Even though neither the US nor NATO denied such demand, both of them declared that they were already in the Black Sea. TurkStream, which consisted of Russia’s alternative energy pipelines and edged out Ukraine, was already completed, and there was a discussion on the extension of this pipeline in Europe. The Kerch provocation further targeted at this natural gas pipeline. In the meantime, there was news on the establishment of a naval base in Sürmene, Trabzon by Turkey. This naval base has become a strategic bargaining chip since it is not certain whether the base would serve to the interests of Turkish bourgeoisie or function as a NATO military base. In the face of such a complex and alarming situation, it has become clear that the agreement on Idlib (Syria) was not settled and Turkey did not disarm the jihadist fractions. Nevertheless, it has also become clear that Syria was soothed by Russian complicated plan. In the midst of critical international dynamics, Turkey declared that it would soon undertake a military operation in the east of Euphrates and started the military build-up, in particular, shifted Free Syrian Army forces in the region. The map demonstrates the current political situation in Syria. We can argue that there are three main hegemonic regions if we consider the ISIS as a tool of the US. 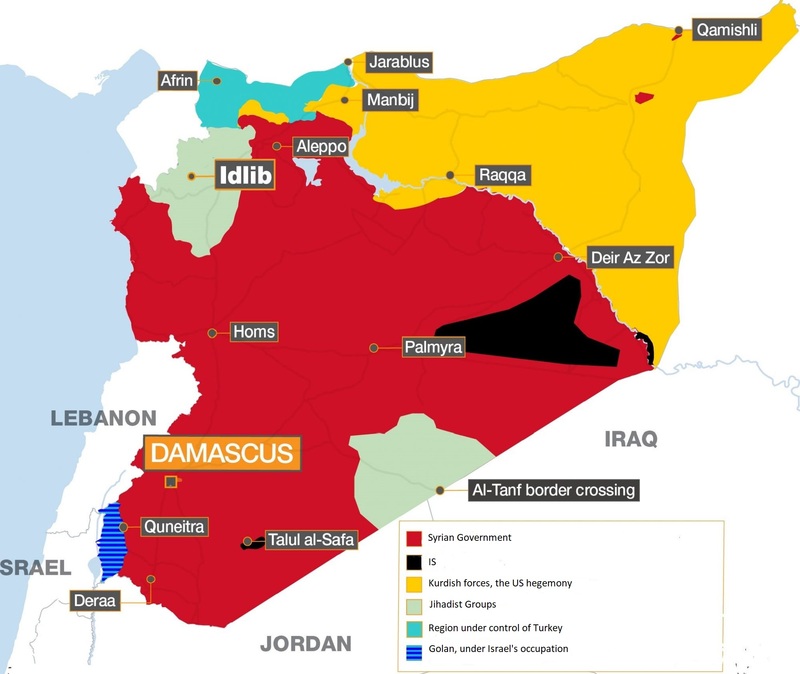 The region in red demonstrates the hegemony of Syrian state and Russia; the region in yellow demonstrates the hegemony of the USA owing to the Kurdish forces, and the region in blue-green demonstrates the hegemony of Turkey. The east of Euphrates is rich in the US military bases, and thus, Turkey cannot enter the region easily in comparison with its military operations in Iraq. The US opposes to but not fusses about any Turkish military operation in the region. The stock exchange market and foreign currencies are stable. Rumour has it that the process to release the manager of Halkbank has become one of the bargaining chips. We can think that Turkey sees an advantageous move in the multi-dimensional formulation and has considered a military operation as a means to strengthen its hand in the face of the complicated imperialist rivalry. The formulation is manifold and it has to do with the military balance in the Black Sea, the application of the 1936 Montreux Convention, the energy pipelines, the future of hegemonic regions in Syria, the arms sales, the relations with Iran, and the rivalry about energy in the eastern Mediterranean, and so on and so forth. Nonetheless, the formulation has nothing to do with the favoring of the working classes. 2019 is the year that will show how this bargaining would take place and how we would intervene into the best of our ability. The war of imperialists is not our war!